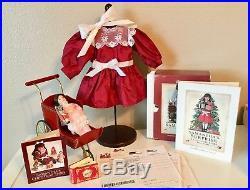 Pleasant Company American Girl 18 Samantha Doll Collection - Retired. 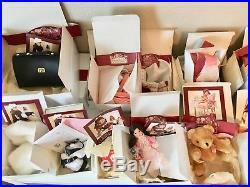 18 Tan Body Samantha Doll, Pleasant Company on Neck with original Box. Samantha's was sent to AG doll hospital and her limbs are tight, skin was cleaned. She has her original eyes and hair - Lovely Condition. Samantha's Accessories, hat, purse, coin, handkerchief, heart locket brooch. Samantha's Steamer Trunk - PLEASE NOTE - missing hanger rod - some wear on metal of truck, drawers and buckles all function well, burgundy ribbon in tact, brass mirror and hangers are included. 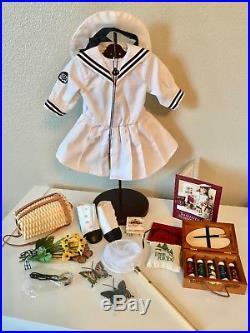 Flannel School Dress with black hair ribbon. School Desk - one or two small nicks. Tea Tin Lunchbox (brass has tarnished with age) food included. Book Strap & Supplies - notebook has a few pages with writing. Cranberry Party Dress with white hair ribbon. Christmas Music Box - wind up mechanism functions. Samantha's Porcelain Doll with Nutcracker. PLEASE NOTE: No Gingerbread house. This was real food project with gingerbread/icing, no longer in this collection. Lacy Pinafore Dress & Rosebud Circlet. Wicker Table & Two Chairs. Party Treats- all four candles for petit fours included (one fell during pic) plastic holder for Samantha included, sealed in package. Middy Dress with Tam & Whistle. Winter Amusements - paper dolls (punched-out), valentines (unused) & ice skates. Brass-plated bed - a bit of tarnish from age - not much. Includes:mattress, beautiful white bedspread & pillow, brass nobs, easy to assemble. Commode - one small spot on front. Play Dress, Pinafore & Hair Ribbon. Scenes & Settings - large book with some wear, few missing inner binding nobs and few bumps. Scenes & Setting Booklet - few winkles. 1997 Holiday Catalog - features Samantha & her Collection. Samantha 6-Book Set - Hardcover books with Slipcase - shows wear. Pamphlets of Samantha's stories - lots of these. Additional Items to original collection. 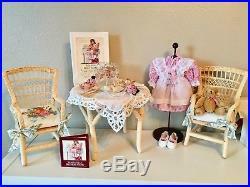 Doll Travel Set - wicker basket, 2 garmet bags, 1 ditty bag with PC cloths (bag has discoloring on bottom). 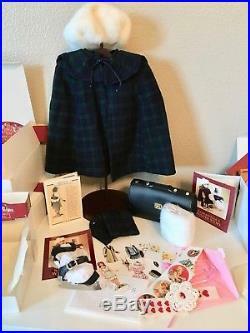 Samantha Doll - Original Box. Accessories have Original Boxes and are complete. 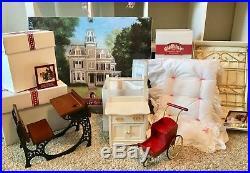 Bed, Commode, Desk, Doll Pram have original boxes. 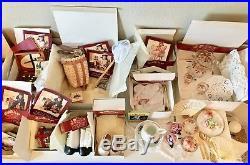 PLEASE NOTE: Wicker Table Set, Steamer Trunk, Scenes & Setting do not have original boxes. Collection is clean, odor-free, pre-owned condition with few noted flaws but overall amazing condition especially being over 20 years old. 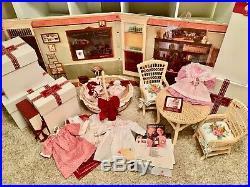 Collection will be insured and tracking numbers provided. Please feel free to ask questions & Thank you for Looking. 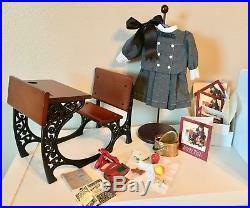 All AG/PC items in the photos are included with the exception of the wood dress forms. 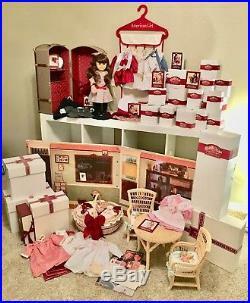 The item "American Girl Pleasant Company Samantha Doll, Trunk, Clothes, Huge Collection 1997" is in sale since Sunday, November 18, 2018. 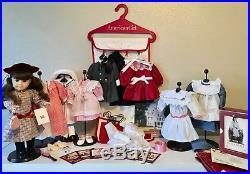 This item is in the category "Dolls & Bears\Dolls\By Brand, Company, Character\American Girl\Samantha". The seller is "happynana1" and is located in Sherwood, Oregon. This item can be shipped to United States.